Pinkadots Elementary : Workshop Wednesday: Motivating Writers! Good morning! 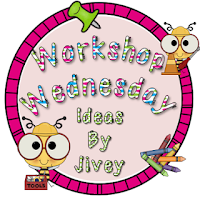 We are linking up with our amazing teacher friend, Jivey, over at Ideas By Jivey for Workshop Wednesday. Today's topic was motivating writers and since writing is my most favorite thing to teach, I had to jump on it. I tend to get uninspired/unmotivated writers at the beginning of the year and turn them into fourth grade authors by the end of the year. I don't know how I actually do this, but somehow when kids leave my classroom they end up love writing. I do have a few tips up my sleeves to get them there. Unfortunately, I had my ideas incorporated into my units perfectly, but with the CCSS starting this year, we rewrote our curriculum completely and I was unable to do some of my favorite projects. It's okay though because I still had a successful year turning the most redundant writers into amazing authors. I find my best plan to get the students motivated is to allow them to write wherever they are comfortable. Jivey took my answer by talking about how she allows them to write on clipboards. We do this in my classroom too. So now I am going to "one up her" (haha) and say that i-Pads are also an amazing motivator in the classroom. They have made my struggling students confident and enthusiastic writers. The students love typing in the Notes App, looking up words in the Thesaurus App, and even emailing their writing to their parents, me, or past teachers for feedback. This doesn't seem like a huge deal, but seriously it has helped dramatically! I don't know if lack of confidence in spelling was a handicap for some of my friends, but whatever it was, I am happy they are getting some typing time as well. 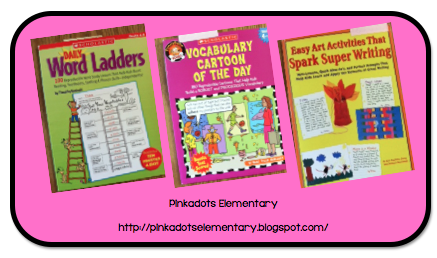 Besides adding technology, here are some of my secret weapon teacher books. I love each one, but the last one is my favorite! I love using Word Ladders for morning work. The students love working against each other to see who can get the most correct answers the fastest. The vocabulary used is not only excellent reinforcement to the students, but also amazing enrichment for my motivated students. I absolutely love when I see the students use new words in their writing. Whether they use their new found vocabulary in quick journal writing, writing prompt writing, or whatever type of writing we are currently working on in class. When my students use new words that they have learned, I have them underline the words and then they get extra points on their spelling tests for so many correct vocabulary words used in assignments. It is a great motivator to get the students to extend their writing and vocabulary. We use the vocabulary cartoon of the day for once a week homework. The work is fun and once again it is a great extension activity and enrichment for my students. The last book, "Easy Art Activities That Spark Super Writing" is by far my favorite purchase. We used to use Empowering Writers as a writing program, but have since rewrote our own curriculum and do not use a program. We now teach Narrative, Persuasive, Expository, and Opinion writing all in 4th grade. A few years ago, I purchased this book at a conference and have used a TON of ideas from it. Some of my favorites were the Magic Carpet Ride, Ouch, The Leprechaun Trap, and the Dream Room. The writer's techniques covered in this book are Summaries, Elaborative Detail, Suspense, and Main Event Writing. The fun part is that each technique has multiple activities and involve a writing piece and a corresponding piece of artwork. The students have so much fun working on their projects, they don't even consider it learning, but they sure are. In fact, later on when we put all the techniques together in a complete narrative, they remember the small projects and the different techniques that were taught and mastered at the time. Thanks for sharing all of the great and motivating ideas! I love the ideas of clipboards in the classroom and we have iPads in our room but I never though of using the Notes App for reluctant writers. Such an easy thing-I will have to give it a try! PS I love you beautiful flowers! I use Word Ladders in my classroom, too. It quickly becomes one of their favorite times of the week. I love Word Ladders too and so do my students! They are even writing their own now. So fun!